Smith's crew on the job carrying out slab construction. 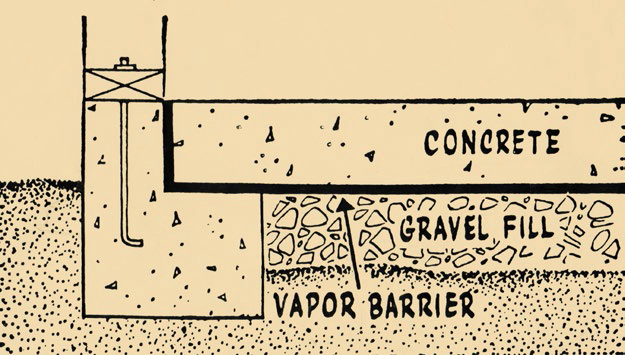 Smith's innovative concrete slab design (illustrated here) was as integral to his success as his roofs. As NAHB president, Smith made appearances nationally. 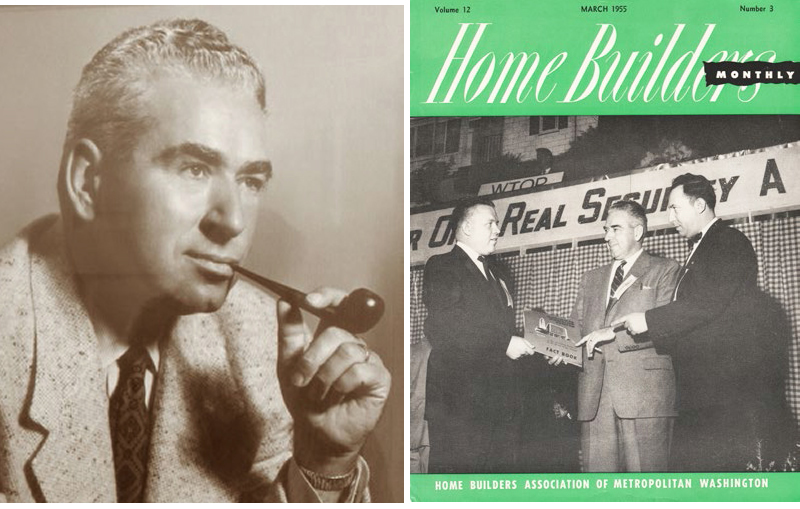 Here, he appears on the cover of Home Builders Monthly magazine in 1955. An important part of Smith's winning strategy, House and Home noted, was his focus on smaller cities and towns. They called him the nation's "most mobile" builder for his practice of building a half-dozen or more tracts simultaneously in scattered locales. One ad from the mid-1950s showed 150 homes planned in Shannon Estates, San Jose; 2,400 in Milford Village, Milpitas; 500 in Los Ranchitos, Newark; 750 in Fairmede, Richmond ("on top of the world"); 646 in Montalvin Manor (a shoreline north of Richmond with an "ever-changing sunset view"); and 1,500 in Shore Acres, west of Pittsburg. Smith ran his operation from an office in El Cerrito, directly across the Bay from San Francisco, alongside Griffin Lumber Co., which supplied his precut lumber. About a dozen men worked for Smith, including twin brothers Henry and Rae Smith. Earl Smith's wife, Dee, worked for the firm in the earlier years when it was based out of the cheery Spanish home Earl built for the family in 1938, just up the hill in the prosperous enclave of Kensington. Although at least two architects worked for the company, Smith is said to have designed all the homes himself. One of Smith's architects, Carl Lans, was well known as an advocate for low-cost housing. He'd been technical director of the NAHB and edited a book, Design Portfolio: 68 Selected Designs of Modern Homes. Smith was quite a showman, hosting Joe Louis at the opening of Parchester Village, an early, mostly black neighborhood near Richmond; and boxer Max Baer along with a circus elephant at the opening of Shore Acres. Smith came by the building trade naturally. His great grandfather was a builder in Germany, as was Smith's grandfather in Wisconsin and then Los Angeles, and Smith's father in the Bay Area. Smith grew up in Oakland. After a brief stint as a stage actor and a commercial artist, Smith worked as a carpenter and as a small builder, often with his father. The family was hit hard by the Depression, Geoff Smith says. Earl worked at a Ford factory and did anything to get by. "Dad was [even] making chicken pies and selling them to restaurants," Geoff says. In 1938, Smith found the wherewithal to fill a small block in El Cerrito with five attractive ranch-like homes. "Mom said he built them with his own sweat and blood," Geoff recalls. Earl's big break, however, didn't come until after the war. According to the Post, he had built a traditional house with a price tag of $9,200. "Knock off a couple thousand more and I could buy," one veteran told Smith. "Flat roofs and slab floors were making architectural news for showplace homes then," the Post reported, but not for tract homes. "No one had tried it before on the assumption that only the $50,000 buyer would be interested in modern." But Smith gave the flat roof a go, and the concrete slab as well, figuring it would cut his costs by 20 percent. He built his first flat-top on a quiet residential street in El Cerrito.